This is a 2-day event. Each day's hours are 8:00AM to 5:00PM. Full participation is required for certification--no exceptions. Go Platinum – and experience what world-class training can do. This class is offered in partnership with PMI to support the local PM community. This highly interactive certification course provides in-depth understanding of the Scrum team-based approach to iterative development. The course trains participants in the full range of Scrum topics, from basic theory to organizational implementation, including practical applications, roles, and scaling. This course provides Scrum Alliance Certified Scrum Master certification, 16 PDUs toward PMP recertification and 16 PDUs toward PMI-ACP certification. When this course has been completed, attendees will have gained in-depth practical knowledge of Scrum and its benefits. Platinum Edge provides one of the best training programs in the industry. We have so much confidence that you will be satisfied with our training that we offer a 100% money-back guarantee. If by the end of the course you are not satisfied, you will receive a full refund of the registration fee. A full refund will be provided for any reason prior to one week before the start of the class. If less than one week prior to class, you will be charged $100 if you cancel and do not transfer your registration to a future Platinum Edge class. Please see our Frequently Asked Questions page for answers to other common questions. 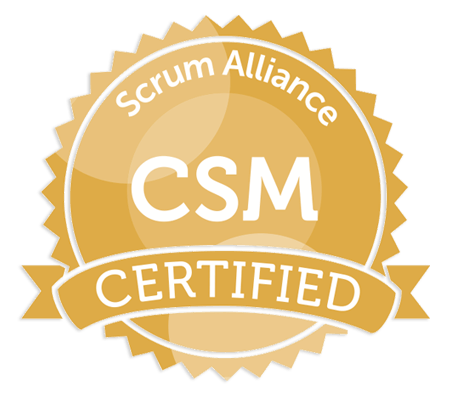 CSM is a registered trademark of Scrum Alliance, Inc. Please contact us to discuss private or partnership classes.